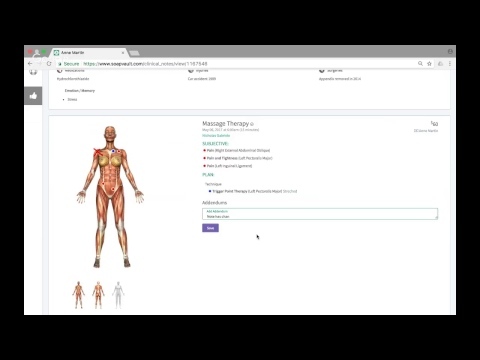 SOAP Vault is a practice management software which enables massage therapists, chiropractors and other chart users to create, store, and retrieve clinical notes as well as chart, book, and track patient treatments from any internet-enabled device. Designed to help users run every part of their practice, SOAP Vault supports SOAP charting, appointment scheduling, online booking, patient management, financial management, and more. SOAP Vault’s charting tools allow users to tag, draw or type up their treatment documentation from any device. Machine learning predictive charting helps users tag and categorize notes automatically. SOAP Vault allows users to duplicate notes in order to streamline subsequent patient visits. With SOAP Vault’s color-coded scheduling calendar, users can track and manage appointments, with recurring and click-and-drag appointments. Customizable intake forms allow users to create forms for any type of practice, and select which questions and sections should appear on the form. Users can also create their own special consent forms, which can be signed electronically by patients. SOAP Vault gives users centralized access to all patient related forms, notes and treatment receipts. Data import and export technology allows users to import and export patient data anytime. Financial tracking functionality gives users accurate insight into clinic sales, revenue and tax information. Offering a separate analytics sections, SOAP Vault allows users to track the clinic’s KPIs, and utilize that insight for marketing, research and treatment planning purposes. SOAP Vault also supports call, email and text reminders as well as patient labeling, arrival tracking and birthday reminders. I have no need for an intense physical filing system, so far! And as my business grows and I add practitioners, it will be easier to provide tablets rather than store endless reams of paper!The recently added ability to attach files has been a huge bonus, as my regulatory requires certain documents to be linked with EVERY clients chart note. Being able to draw on images was probably one of my favourite updates as well. I love how fast the responses are of the help centre as well. Great customer service. Keeping everything digital has been made almost flawless with SOAPvault! The recently added ability to attach files has been a huge bonus, as my regulatory requires certain documents to be linked with EVERY clients chart note. Being able to draw on images was probably one of my favourite updates as well. I love how fast the responses are of the help centre as well. Great customer service. Keeping everything digital has been made almost flawless with SOAPvault! The inability to create my own fields on my health intake forms is a little limiting, as regulatory bodies for healthcare professions differ in their requirements province to province. I have had to find creative work arounds for the combination of having public healthcare and private, while only having a field for private insurance information. More importantly, while it's easy to track how much money I bring in overall, I can't use soapvault to track how much of each treatment was paid by insurance and how much was cash/debit/credit. I only have a 'treatment paid by' and 'cost of treatment' option for my invoice. After working as a medical office assistant, I've found I much prefer a more detailed method of invoicing/inputting payment types, so I have a record of payment and insurance billing in one place. The SOAPvault lack of options regarding payment/insurance billing makes it difficult if my clients need to submit their invoice with amounts already paid to a secondary/spousal insurance coverage plan. This impacts my business especially because to gain and retain clients I am set up for direct billing with insurance companies. Less paperwork for me to fill out, saves time for me which is important. Clients provide more health information when they don't feel pressed for time, so I am able to provide better service for them and communication improves. At one point I worked in multiple locations, so not having to carry around paperwork was nice. Many clients appreciate being able to fill out the forms online, especially if they have complicated health problems that would take up time from their treatment if they filled it out in my office. Hippa compliance was a must and this has that. At one point I worked in multiple locations, so not having to carry around paperwork was nice. Many clients appreciate being able to fill out the forms online, especially if they have complicated health problems that would take up time from their treatment if they filled it out in my office. Hippa compliance was a must and this has that. Everything. It has everything I need and works great. The online booking system has saved me a huge amount of admin time and being able to have all of my notes for every client in one place with their treatment history and receipts that get sent out once completing soap notes is great. The way the notes are set out so that it is easy to see what areas of the body have had treatment and pain makes it great when dealing with a high turn over of clients. My time spent doing notes has halved using Soap Vault as being able to select areas on a body and add treatments ect and notes specific to the area make everything so simple. Also the customer service team are amazing - they are always very helpful and look into any issues as soon as they can (within 24 hours normally - I am in New Zealand so there is a huge time difference and this is a great response time for being international). The team are also always making improvements to the system and are happy to take on any feedback about things that may work better as a customer or new ideas). Optional extras: Text Messaging, File Storage, Call Reminders, Additional Practitioners. SOAP Vault enables patients to check availability, then book appointments at any time, from any internet-enabled device. Users can connect their appointment schedule to an external calendar, allowing them to view clinic appointments in Google Calendar, iCal, or Microsoft Outlook. SOAP Vault is mobile-friendly and supports iOS and Android web apps, giving users the flexibility to chart on-the-go via a tablet or smartphone. Security features including 256-bit encryption, hourly data backups, and access controls ensure sensitive data is managed safely and securely to maintain HIPAA compliance. SOAP Vault supports email marketing integration with MailChimp, allowing users to create and share newsletters with their entire patient list. Below are some frequently asked questions for SOAP Vault. Q. What type of pricing plans does SOAP Vault offer? Q. Who are the typical users of SOAP Vault? Q. What languages does SOAP Vault support? Q. Does SOAP Vault support mobile devices? Q. Does SOAP Vault offer an API? No, SOAP Vault does not have an API available. Q. What other apps does SOAP Vault integrate with? Q. What level of support does SOAP Vault offer?